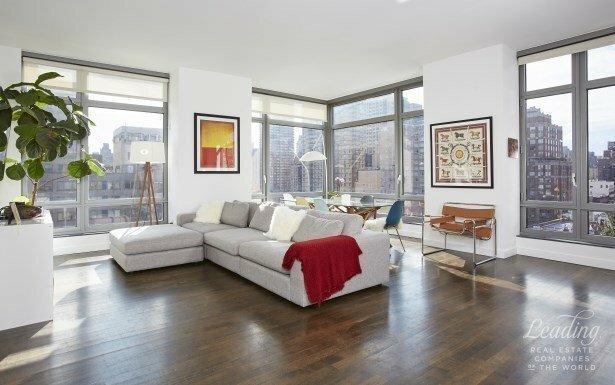 This large and modern split corner two bed, 2.5 bath corner home boasts brilliant South and West light from its floor to ceiling windows. The layout is ideal for entertaining with a spacious and open living/ dining room and a tasteful windowed chef center island kitchen featuring a Wolf oven, Sub-Zero fridge, Miele dishwasher, built in microwave/convection oven, generous custom cabinetry. The home features incredible closets and a washer/dryer hook up. Master suite boasts a walk - in custom closet, a marble bath with dual sinks, soaking tub and separate shower stall.The Cielo Condo (completed in 2006) is a White Glove full service luxury condominium with beautiful lobby, 24-hour doorman, live in super, children's playroom, fitness center and garage. Near beautiful Carl Schurz Park, Central Park and East River walkway. Any cook will appreciate having Whole Foods, Fairway, the convenience of the upper east side and nearby terrific restaurants!